Manifold systems are widely used with underfloor heating and this same principle can be applied to wall hung radiator systems to gain the benefits of faster installation, individual isolation of radiators and fewer joints in the pipework reducing the chances of a leak. Conventional radiator heating system design relies on a large bore 22-28mm flow and return (commonly in copper) installed in a ring circuit with smaller bore 10-16mm feeds to each radiator to ensure even flow is achieved. This type of system can be time consuming and disruptive to install; has high material costs and can be difficult to balance and control correctly. By using a manifold system, the large flow and return pipework is minimised and allows smaller bore, more flexible pipework (such as Emmeti Gerpex MLCP) to be used, making it ideal for new build construction as well as refurbishment, in both domestic and commercial projects. 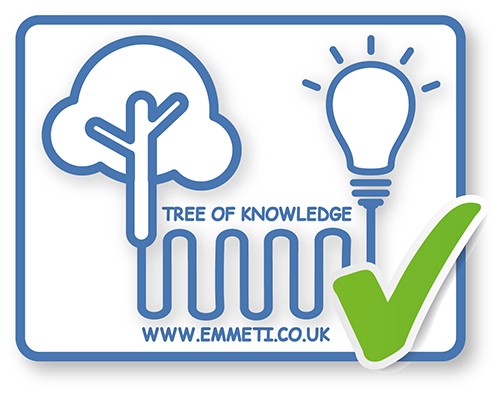 Using Emmeti wall hung radiator manifold systems can also enable the use of ‘zone control’ in a property. This allows the home owner or building occupier to tailor their heat to suit their lifestyles making it much easier to create ideal comfort levels and prevents the unnecessary heating of unoccupied rooms improving the energy efficiency of the building by up to 40%. What is Point to Point Plumbing? Point to point plumbing applies to both plumbing and heating installations. It is about how you install the pipework, from A to B, where A is the manifold and B is the point of use, whether it is a bathroom tap or a wall hung radiator. Each individual radiator is supplied using a continuous length of pipe from the manifold, with the only joints in the system at the radiator and at the manifold. This reduction of joints in the system reduces installation time and vastly decreases the potential for leaks, reducing costly and disruptive call backs to site or insurance claims. The reduction in fittings along with the speed of installation will more than offset any additional costs incurred when purchasing the manifold and additional pipe. Reduced installation time of between 30%-40% due to less joints and smaller pipe sizes. Ensures that you have good accessibility in the event of a problem – No concealed intermediate joints under floorboards or inside walls limits the points at which a leak could occur to the radiator and the manifold, significantly reducing the time for fault finding. All joints are above ground and are easily accessible. By using a manifold system, the large flow and return pipework is minimised, allowing you to use smaller bore, more flexible pipework. Allows you to improve planning, organisation and standardisation on site, benefitting the build program for your project. Benefits health and safety on your project, cuts down the amount of hot works on site. Pipe is simply run between manifold and radiator location, in one continuous length. Smaller bore, flexible Gerpex pipe (or similar) is used which is much easier to install providing potential time savings for your project. Using Gerpex MLCP pipe (or similar) with a manifold system promotes the smooth flow of water around the system, minimising running noise and giving you a more comfortable environment. Provides you with considerably reduced maintenance costs through less disruption, down-time, and maintenance engineer cost and time on site. Your manifolds can be installed in a convenient location such as a riser or service cupboard for easy access meaning less disruption to the building occupiers and ease of repair/ maintenance for engineers and contractors. By specifying this system it allows you to add value to the project with an improved method of installation. This will optimise time on site whilst selling confidence to the client with ease of maintenance and reduced chance of leaks. Specifying a manifold system will allow your clients you to tailor their heating to suit the building activities by allowing rooms to be controlled individually. This will offer up to 40% saving on energy consumption**. Manifolds give you a precise, neat design and layout allowing a convenient central location for ease of distribution, service and maintenance. Find out more about Radiator Manifold systems, zone controls and Gerpex Pipe and Fittings.